Miguel-Anxo Murado is a well-known Galician writer and journalist who spent periods of time in the ex-Yugoslavia and the Middle East. Much of his fiction is based on these experiences. Noise: War Stories details his experiences in Bosnia and Croatia, End of the Century in Palestine reflects on his work as a press officer for the United Nations during the Second Intifada, The Fever Dream grew out of an attack of fever in Cairo. One of his most lyrical story-books is Ash Wednesday. All his fiction draws universal lessons from seemingly insignificant or transient details. He has also published poetry, drama and essays (including one on Japanese life and culture, Japanese Notebook). He is a regular contributor to The Guardian newspaper. 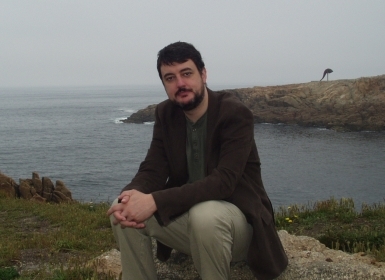 Miguel-Anxo Murado specializes in short stories that take temporal events and turn them into something universal. Ash Wednesday (172 pages), a collection of sixteen such stories, is one of his most accomplished books. The priest’s finger slid over young Salva’s forehead, from above to below, from right to left. North, south, east, west. He deposited a cross, a cross of ashes. The boy got up from the cold stone floor and went back to his mother, who also had an ash cross on her forehead, like everybody else. An ash cross. A premonition of the day to come. Outside, not far away, the fire was breaking out for the third day running. As the prayers of the funeral mass continued, one could smell the smoke in the air, getting closer and closer. On leaving the church, he saw it – a black column rising up from the horizon. Outside the church, several neighbours were standing, watching the fire. Penelo and the other made their way through the group in search of young Salva. To begin with, they’d hesitated whether to go and fetch him or not, since he was in mourning, but in the end they went, they needed as many men as they could get. Young Salva listened to the words of his cousin. It was better to be in the fire than to while away the time, suffering at home. Better to try and do something. The baker picked them up, he was going to help as well. It took them little more than ten minutes to reach the point where the teams were gathering. The fire was almost at the side of the road.